Adding our Rear Guard Insert to your child’s backpack adds less than one pound but it can take a ton of weight off your shoulders when you know they are safe at school. Although most of us will never be on a traditional battle field, unfortunately our schools, office buildings, concerts, and other public places are all too often turned into war zones that require us to be prepared to take defensive action. Everyone knows to flee at the first sign of an active shooter. The Rear-Guard Backpack Insert from Streetwise Security Products keeps you safe during your retreat. When fleeing is not an option, you can remove your backpack and hold it in front of you as a shield. Will I really be protected? 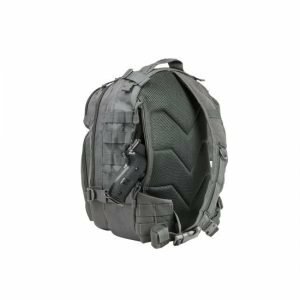 The Streetwise Rear Guard Backpack Insert instantly converts your ordinary backpack, laptop case, or handbag into a ballistic shield capable of stopping nearly all hand gun rounds (even 9mm and .44 Magnum!) as well as protection from sharp or pointed weapons. But don’t take our word for it; our inserts have been tested by an independent facility to National Institute of Justice (NIJ) Level 3A standards. This is the highest level of protection currently available for lightweight, flexible (soft) body armor. Why not just buy a bulletproof backpack? Bulletproof backpacks have been on the market for several years. Although they are expensive, they do offer good protection. The problem is that not everybody likes to carry a plain black backpack. Although I am the president of Streetwise Security Products my most important job is being the father to 5 children ranging from age 6 to 19. I can attest to the fact that each child has a unique style and taste, and (just like their music) they are not crazy about the “one size fits all” approach to their backpacks. So now rather than throwing away perfectly good backpacks which our kids love and buying them an expensive, generic looking “bulletproof backpack” that they won’t want to carry, our Rear-Guard insert can convert their current backpack into a ballistic shield for about half the cost! It can be used for up to seven years so when their backpacks wear out or their style changes our insert can be easily removed and transferred to their new one. What is it made of and is it practical to carry? Unlike the heavy, rigid chunks of metal used in the past, our Rear-Guard insert is so flexible and lightweight they will not even know they are carrying it. Made of a high-tech material know as Ultra-High Molecular Weight Polyethylene (UHMWPE), it measures 11 by 14 inches, weighs 1.5 pounds, and is flexible enough to conform to whatever it is placed in. Because our insert contains no metal it is airport and TSA friendly to ensure that you and your loved ones will be protected even when traveling.